Under the leadership of the Board of Trustees, the Institutions of Higher Learning provides guidance and management for all public universities in Mississippi. The university system has eight distinct, mission-driven universities that enhance the quality of life of Mississippians by meeting their educational needs. The university system places emphasis on student achievement and on preparing responsible citizens, adheres to high academic standards and quality instruction, research, service, and facilities; and is committed to affordability, accessibility, and accountability. Serving more than 95,000 students in an academic year, Mississippi Public Universities prepare students with the knowledge and skills to be the leaders, educators, entrepreneurs and problem-solvers of tomorrow. Two-thirds of the system's students are Mississippi residents. With almost 900 degree programs are offered across the university system, more than 17,000 degrees are awarded each year. The programs available at our universities range from a wide variety of undergraduate disciplines to most professional fields. All eight universities offer master's level programs. Six have programs at the education specialist level and six offer doctoral-level programs. The university system includes more than 300 Centers & Institutes and contributes to a richer, better Mississippi and touch the lives of all Mississippians through outreach, service and research. Mississippi State University's Extension service delivers research-proven information to Mississippians in all 82 counties. The University of Mississippi Medical Center is the state's only academic medical center and includes six health science schools: medicine, nursing, dentistry, health related professions, graduate studies and pharmacy. UMMC offers the only Level 1 Trauma Center, the only Level 4 neonatal intensive care nursery unit, and the only organ transplant programs in the state. 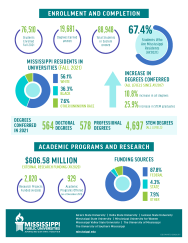 Mississippi Public Universities contribute to Mississippi's economy through job creation and student spending. The university system contributes more than 59,000 direct and indirect jobs to Mississippi employment. The system's expenditures generate $2.46 billion in economic impacts in the state. Mississippi's public universities play a crucial role in supporting the State of Mississippi's vision of strategic investment in the state's human capital and supporting the state's mission to promote growth and the public good through the advancement of the individual. Through its tri-fold mission of education, research, and service, the university system advances the state and provides an excellent return on investment.